Planting a Forest...One Test Drive at a Time. Native trees are critical to the health of the Pacific Northwest. Trees improve air quality and reduce greenhouse gases, shade creeks and streams cooling water for threatened salmon, reduce erosion and filter pollutants, improving water quality, and providing important wildlife habitat. Since 2008, Carter Subaru has planted over 190,000 native trees in the Mountains to Sound Greenway. Here's how it works: for every test drive taken at Carter Subaru, we'll plant one native tree in the Greenway. For every car sold, we'll plant 3 more trees, for a total of four. Why four trees? Because four trees that live a lifespan of about 75 years will absorb the approximate amount of carbon dioxide of the average car driven one year. As part of our commitment to reducing our carbon footprint, we've partnered with the Mountains to Sound Greenway Trust to provide the trees - and they provide the volunteers. That's where you come in! Join us out in the Greenway in the fall and winter to plant these critical native trees and shrubs that help improve the ecological health of wonderful parks, natural spaces and riverbanks. Tree planting happens after volunteers have worked hard throughout the spring and summer to remove invasive species in specific areas. Greenway Trust volunteer events are excellent for individuals, families, groups, and work teams. No experience required and they are a lot of fun! Thanks for helping up plant a forest… one test drive at a time! A new information kiosk welcoming visitors to Lake Sammamish State Park and providing information on how trees are the cornerstone of the eco system was unveiled on October 22, 2016. Vast forests. Meadow-strewn mountain peaks. Small farms that feed city markets. Rural communities and vibrant cities. Hundreds of places for skiing and hiking, kayaking and cycling. That's the Mountains to Sound Greenway. Weaving together the urban and the wild, the Greenway encompasses over 1.5 million acres of connected natural lands and vibrant urban areas surrounding I-90 between Puget Sound and Central Washington. The Greenway conserves a shared heritage of working farms and forests, parks, sustainable communities and abundant outdoor educational and recreational opportunities. 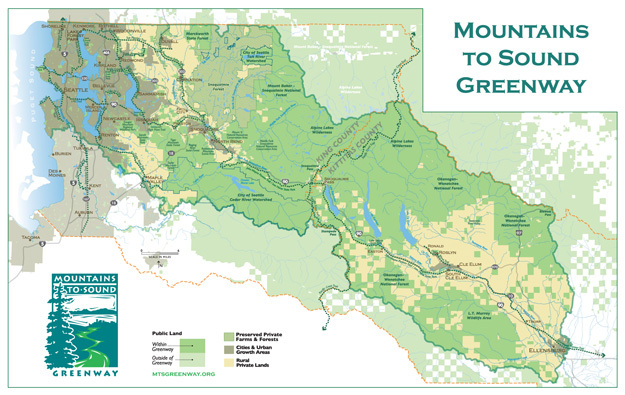 This map illustrates that the Mountains to Sound Greenway is bounded by major watersheds, framed by the urban areas of Seattle and Ellensburg and woven together by an interstate highway and includes an extensive network of trails linking the public to the Greenway landscape. In one year the average car puts over 5 tons of Carbon Dioxide into the air. Together, we can decrease your carbon footprint. How? By test-driving a Subaru at Carter Motors, we will plant one tree in your name in the Mountains to Sound Greenway, the scenic byway along the I-90 corridor stretching from Seattle over Snoqualmie Pass into Central Washington. If you buy a Subaru, we'll plant three more, helping reduce your carbon footprint even further.